In the new world of Ragnarok Online 2, every player will have the ability to craft powerful weapons, awesome potions and delicious food! Each character gets to choose the profession of Alchemist, Artisan, Blacksmith and Chef. Each profession comes with its own special outfit! When you select one at the start, this will be the start of your profession in game! 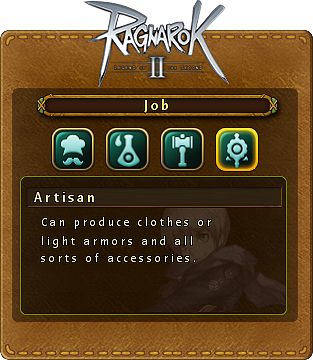 You will gain Job Levels by gathering your job specific materials and by crafting increasingly difficult items! Take the time to level your Job so you can craft amazing items!